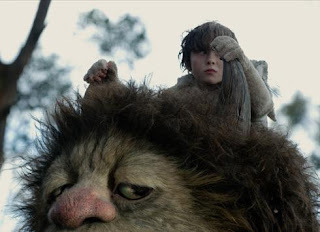 No doubt about it, Where the Wild Things Are is a product of magical madness, the result of a gutsy studio (Warner Brothers) handing an ultra-pricy property to a maverick auteur in the hopes that some sort of movie-making alchemy would take place. 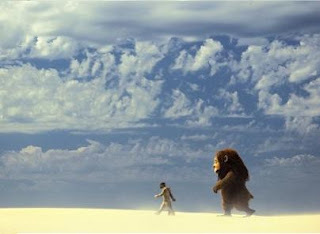 With Spike Jonze, the punk-rock wunderkind responsible for the surrealistic head-trip epics Being John Malkovich and Adaptation, vividly reimaging Maurice Sendak’s uniquely illustrated beloved children’s literary staple, the final product was destined to be peculiar and challenging - a reality which incited numerous behind-the-scenes creative fisticuffs. Fortunately, from the turmoil has emerged an oft-flawed beauty of a film whose emotional and visual triumphs outweigh its pesky narrative shortcomings. 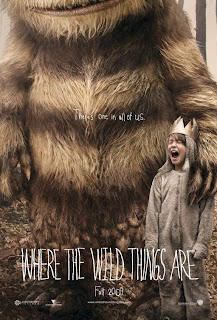 From the outset, with its graffiti-covered opening titles – which are curiously reminiscent of the studio’s The Dark Knight viral marketing campaign – and dynamic handheld opening featuring the movie’s little hero Max (Max Records) aggressively wrestling with the family dog, Where the Wild Things Are wears it’s down-and-dirty indie aesthetic on its scruffy, frayed sleeve. 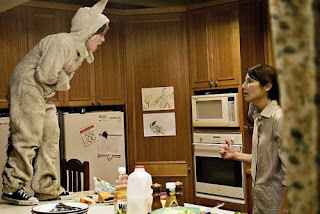 Jonze has hardwired the look of the film to the rambunctious psyche of his diminutive protagonist, a thin-skinned, hyperactively imaginative young boy trapped in the gulf between childhood and adolescence, desperate for the attentions of his popular older sister and busy single mom (the invaluable Catherine Keener). 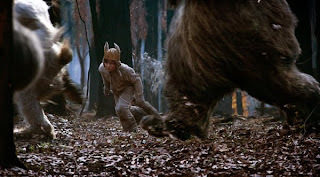 After a nasty domestic fight, spurred by the presence of a male suitor (Mark Ruffalo, in a brief part), little Max runs anxiously from the house and into the nearby woods. Or does he? Max’s distressed entrance into the dim forest transforms into an epic journey across turbulent seas and craggy precipices, drawing him into the ominous island woodlands which the wild things call home. Initially threatened by the gargantuan creatures, the young boy is saved from certain devouring by the hot-blooded Carol (James Gandolfini), the volatile outsider of the group who convinces his monstrous family unit to crown Max as their king. Proving to be an eager ruler, the juvenile monarch initially engages the towering beasts in numerous games and fort-building ventures, before more complicated issues begin to rear their head. While Carol pines for the attentions of the distant KW (Lauren Ambrose), and the smaller, sensitive Alexander (voiced by Paul Dano, and resembling the bipedal cousin of The NeverEnding Story’s luckdragon Falkor) yearns to have his voice heard, Max finds himself having to empathize with and ease the complex painful feelings of his hulking subjects before summoning up the courage to return to his earthly home. The world created by Jonze and his art department is both wondrously pristine and domesticated, and when we step into it, leaving behind the authentic middle-class suburban reality of Max’s universe, we are entering a new kind of place entirely; a fantastical land which stirs within us a sense of marvel and inquisitiveness. Inhabited by the immense monsters - stunning achievements of CG and practical effects - which bear grubby, matted fur and unclean claws, the island is a setting where the dreams of cinematic enthusiasts come true. Watching Max and his newfound friends standing on a cliff, perilously close to the treacherous surf, howling at the golden horizon, waves of astonished chills flowed down my spine. There are numerous moments in Wild Things that will leave you breathless with appreciation. Truly, the film’s success hinges on young Max Records, a real find, who plays a refreshingly natura listic kid; playful and intelligent, but also irrational and difficult. We believe the unfolding extraordinary events because we believe he does, and his relationship with Gandolfini’s lovingly textured Carol is superbly developed. 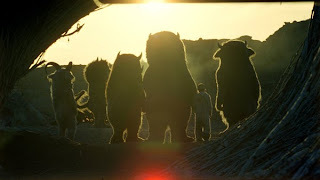 They have a heart-to-heart while journeying across a sandy plain that is intensely moving and a visit to the monster’s secret model room produces one of the film’s most gorgeously memorable scenes. Yet one has to question who the film was made for. The script, by Jonze and Dave Eggers, is exceptional at conveying the deeper meanings behind the monsters’ personal parallels to Max’s own life, but too formless and oblique to be an easil y accessible story. Frankly, it’s often something of a downer, with an omnipresent air of melancholy and an intentionally uncertain ending. As much as kids love ambiguity and rich subtext, Wild Things feels like the work of an eccentric filmmaker completely baffled by the wants or needs of his target audience, more interested in playing to the parents who are capable of performing the necessary heavy-lifting. Although the movie ultimately falls short of its lofty aims, there is a beguiling purity in its dark, wounded soul that captures a greater truth – one which some may feel sli ghtly uncomfortable acknowledging. 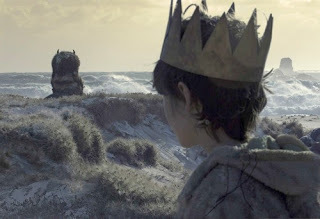 Jonze’s Where the Wild Things Are is an entirely new breed of animal altogether, a grown-up children’s fable with passion and bite. There are wonders to be found within its gloomy frames, but what you discover there may not be quite what you were prepared for. *Originally printed in SFU's The Peak: Oct. 19th, 2009.